You’re considering learning more about business analysis. Well, what is business analysis? Consider colleges and universities that teach business administration, or you’re going for business courses, there could be economics, there could be scheduling, understanding, there’s certainly IT based and non‑IT based materials. The common foundation behind business analysis is a practice in a career, includes the bullets here. If you’re thinking about becoming a business analyst and studying business analysis, these are the topics that you want to focus on. Because we have a lot of students who come to me for project management, let me help you understand the difference. Inside of a project, you’re identifying stakeholders, and you’re going to figure out how to communicate with each of the stakeholders in your projects based on their needs. Like I talked about a power influence grid, there’s other modules associated with that. When we get to business analysis, you’re talking about understanding how communication happens between stakeholders because of processes and systems within your business, as well as, an enhanced understanding of communications for projects with project managers, between project managers and business analysts, and the different roles that business analysts, project managers, and stakeholders play in guiding the success of a business, not just the success of a project. You’re also working on needs identification. 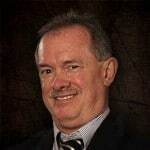 Now, in a project, someone has typically written a business case that says, “This is the high‑level need of a project.” Well, it’s the business analyst who does that internal rate of return, net present value, cost‑benefit analysis, or other mechanisms, to help you identify that you have a need that might be solved by a project. We also have other business needs. Process changes, organizational structure changes, organizational management changes, general change, management, HR, and operations kind of questions, that might be analyzed using business analysis tools that are outside the arena of what you would do for a project. They’re operational in nature. Business Analysts help to do essentially elicitation of requirements and needs using some more tools, but the tool sets broader in Business Analysis (PMI-PBA) than it is specifically in Project Management (PMP). Other common concepts of business analysis are some of the modeling tools, and terms we use are unique to the industry or the career. We work on that in a classroom to help you understand what those models are. Such as Unified Modeling Language and Requirements Modeling Language. There’s a new System Modeling Language (SysML) that talks about how systems are integrated with people, hardware, software, process, etc. This is the bigger picture of what Business Analysts look at. A simple way to look at it is what is our system? As-Is States or Models? We want to be able to change it to make it better, so that’s what will it be? The to‑be or will‑be state. That’s where Business Analysis changes or differs from Project Management. We’re looking where we are today, what do we need to do to change it, and where will we be tomorrow? Those two end pieces are what help to tie together great projects, but they work outside the scale of projects as well. We also talk about verification and testing. Verification is confirming quality and performance, while validation is making sure that customer needs are being met. This is not just in a project, it’s beyond that. The other common concept that’s within the field or the career of business analysis, to make sure that you’re driving business value in all you do. Not simply meeting a criteria, doing something that’s on a checklist or punch list, but actually making sure that each of the things that you do, each of the decisions that you make provide value. Before projects are even initiated, during projects if that’s the way you choose to approach it, and even after projects have long been completed and the product has been delivered to the customer. Business Analysis (PMI-PBA) covers all these areas. Most of the Business Analysis courses at Interface Technical Training either touch this on a broad‑base or dive deep to help you understand specific tools, skillsets, terms, solutions and mechanisms. 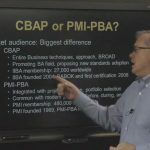 The course that we’re teaching or adding today, in PMI-PBA: Business Analysis for Project Managers and IT Analysts (PMI-PBA Certification) is giving you both the broad overview and preparing you to take any of those deep dive courses you might want to take.